The all-new 2019 Ram 1500 will start at $42,095 in Quad Cab trim when it goes on sale in Canada this spring, FCA Canada announced March 8. Production of Regular Cab will not begin until later in the year, and the pricing for those models will be announced closer to their on-sale date. For now, $42,095 will get you the base model Tradesman Quad Cab 4×2, though the range will top out with Limited Crew Cab 4×4 V-8, available at $74,195 in Canada (all prices listed are before a $1,895 destination fee). Turning the 3.6-litre Pentastar V-6 mild hybrid in the Tradesman and Big Horn models into a 5.7-litre HEMI V-8 with eight-speed automatic will tack on an additional $1,900 to that price. The eTorque mild hybrid system will similarly cost a $500 premium on the other trims standard with the HEMI. The Canada-exclusive Ram Sport also got a sticker figure today: $52,595 for a Quad Cab 4×2, or a premium of about $10,000 versus any similar configuration Tradesman model. The Sport, unveiled at last month’s Toronto auto show, gets a monochromatic exterior with special badging and unique hood and appearance pieces. The prices represent a markup of roughly $2,700 more than a similarly equipped 2018 model on the bottom end of the range. Details for the 2019 Jeep Grand Cherokee are now known, and while the design and the different trims available remain the same as the outgoing edition, the model does get tech and safety updates for the new year. Those trims number seven in all, by the way: The Laredo, Limited, Trailhawk, Overland, Summit, SRT and Trackhawk. We still await pricing information for Canada, and we’ll be sharing that with you as soon as it is available. Here’s a photo gallery of the new 2019 Jeep Grand Cherokee. All Grand Cherokee models now feature Blind-Spot Monitoring with Rear Cross Path detection as standard equipment, and are equipped with standard Apple CarPlay and Android Auto on all audio systems. The latest version of Uconnect’s 8.4-inch touchscreen radio and navigation system includes bonded glass, which features higher resolution and pinch-and-zoom capability. The Limited edition gets a new variant, the Grand Cherokee Limited X; it features a unique front and rear fascia, performance hood, Granite Crystal exterior accents and new 20-inch low-gloss Granite Crystal aluminum wheels. Inside, a black interior with Heritage perforated seats and unique finishes is standard. The Uconnect 8.4-inch touchscreen multimedia centre and a 9-speaker audio system with active noise cancellation are also standard. The Overland edition gets new 20-inch Heritage wheels and Summit models get unique optional 20-inch wheels. Three new exterior paint colours – Slate Blue Pearl, Green Metallic and Sting-Grey – are available. The standard engine for the 2019 Jeep Grand Cherokee is a 3.6L Pentastar V6 producing up to 295 hp and 260 lb-ft of torque; buyers can also opt for a 5.7L V8 (360 hp, 390 lb-ft of torque). The SRT version comes with a 6.4L V8 (475 hp, 470 lb-ft of torque), while the speed-minded Trackhawk is powered by a 6.2L supercharged V8 (707 hp, 645 lb-ft of torque). The SRT and Trackhawk editions offer drivers five drive modes (Auto, Sport, Track, Snow and Tow) to allow them to modify performance to fit the surface and driving situation; the system alters the four-wheel-drive system, transmission, paddle shifters, stability control, suspension and steering. All trims except the SRT get stop-start technology for the engine, which allows for saving on fuel when stopped at lights or in traffic. All Jeep Grand Cherokee engines are mated to the TorqueFlite 8-speed automatic transmission, and all versions get the Quadra-Drive II system with a rear Electronic Limited Slip Differential (ELSD). The fifth-generation Ram 1500 is the latest in a long line of evolutionary leaps for Fiat ChryslerAutomobiles’ bread-and-butter truck. The newest version, more than any other, seems poised to meet the needs of the 21st century truck buyer, with more variety, capability, comfort, convenience, and value than ever before. Despite the minor diet, maximum payload is up to 2,320 pounds, and max towing capacity rises to 12,750 pounds, besting Chevrolet, GMC, Nissan, and Toyota’s half-ton offerings (though shy of Big Daddy Ford’s max towing by 450 el-bees). If you have a large family, you can’t do without a roomy, reliable vehicle to get you and your children from place to place. This is why so many growing families choose minivans. They’re perfect for vacations and road trips as well as everyday trips to school, sporting events and other activities. If you’re ready to shop for your next vehicle, you should see what the 2018 Chrysler Pacifica can do for you. While it’s true minivans don’t get the best gas mileage compared to other vehicles, you’ll love the fact you can drive on the highway for more than 530 miles on a single tank. You can even go 361 miles on city road between fill-ups. 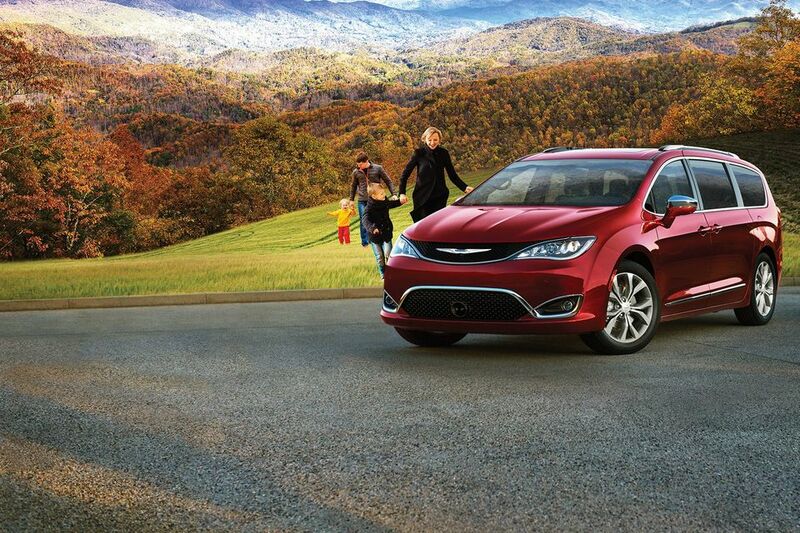 The Pacifica has a 19-gallon tank and gets 28 miles per gallon on the highway and 19 miles per gallon on city roads. It takes regular unleaded gasoline. You’ll use your Pacifica for just about every traveling need, so it’s essential that it has a reliable engine. You’ll feel at ease knowing it generates 262 foot-pounds of torque at 4,000 rpm and 287 horsepower at 6,400 rpm. The Pacifica has a 3.6-liter, 24-valve. V6 DOHC engine with variable valve timing. Every vehicle needs to come with the best possible safety features but this is especially true when you’re transporting your entire family. This minivan has rear door child safety locks to keep your young riders inside at all times. It also has stability control and traction control, both of which will come in handy during less-than-ideal road conditions. You’ll also appreciate the keyless entry and universal remote that come with this vehicle. You’ll also make good use of the rearview camera and the electric power steering. Come to Woodbine Chrysler today and take the Pacifica for a spin. You’ll fall in love with its looks and functionality. Finding the right new car to buy can be stressful and time consuming, especially if you like driving off the beaten path. The new car might need to handle a fun day off-road while still getting you to work safely the next morning. That can make you feel like you’re looking for the best of both worlds, which isn’t always easy. 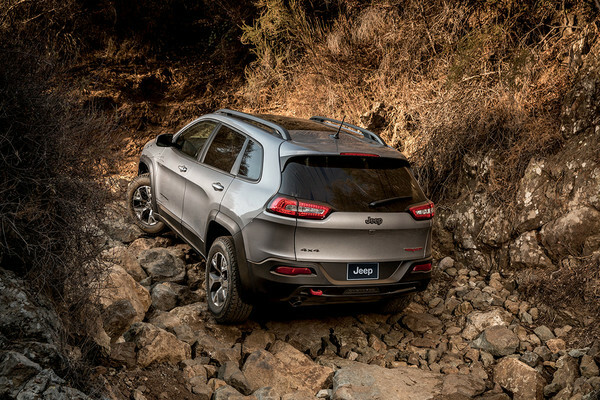 The 2018 Jeep Cherokee has a super comfortable interior to add that element of luxury to all your off-roading adventures. If you’re looking for a hint of opulence in the interior combined which spectacular off-road abilities, the Jeep Cherokee could be an excellent option. When shopping features, you have your choice of engines. You may want the more powerful choice if you regularly tow, but both engines can withstand the test of the wild and run smoothly on the open road. The four-wheel drive along with five different terrain modes could make the Jeep Cherokee one of your weekend essentials. The interior boasts cushioned and adjustable seats with plenty of room for passengers. There are several materials you can use to customize, namely cloth, vinyl and two different types of leather. If one of your main concerns on a long trip or day off-road is the music, the Jeep Cherokee has an infotainment system that is intuitive to use. The standard system includes an audio system with six speakers operated by touch screen, but you can upgrade your speaker count to nine. Also included in the standard system is Bluetooth and parking sensors, but there are plenty of extras that can come in handy. A wireless charging pad, navigation, air conditioning and a Wi-Fi hot spot are all available. All of the convenient features of the 2018 Jeep Cherokee can help make both your special trips and every day commutes more enjoyable. For more information about how the Jeep Cherokee can up your off-roading game, visit the experts at Woodbine Chrysler. From its spacious, comfortable interior to its plentiful safety and entertainment features, the 2017 Chrysler Pacifica is well-positioned to become your family’s signature vehicle. If you’re in the market for a new or used family vehicle from Woodbine Chrysler, give this Kelley Blue Book’s Best Buy Award winner some consideration. The standard maximum seating capacity of seven means the Pacifica’s ideal for you and a single passenger or for you and a group of family or friends. The driver’s seat features an 8-way adjustment and the passenger’s a 4-way adjustment, allowing you to experience a full range of comfort as you take the wheel or relax as a passenger. As with any vehicle, safety is paramount to your driving experience, and never more so than when you’re carrying precious human cargo. Four-wheel ABS brakes, brake assistance and driveline traction control give you the responsiveness you need in a vehicle when you’re out on the road. The minivan also features height-adjustable front and rear seatbelts, nine airbags and rear child safety locks. No matter whether you’re toting toddlers, teenagers or seniors, it’s likely they’ll fall in love with the standard entertainment features that make any trip more pleasant. Wireless phone connectivity, a primary monitor touchscreen, speed-sensitive volume, voice-activated radio and six speakers are sure to thrill your passengers. Whether you’re the driver or someone else takes a turn, the steering wheel-mounted audio controls can make life a little easier, allowing you to keep your hands on the wheel while listening to music or talk radio. Optional entertainment features include internet access and an entertainment system with DVD and digital media. For these three reasons and many more, the 2017 Chrysler Pacifica from Woodbine Chrysler may be just the ticket for your family’s next vehicle. Bring your clan to the dealership and gauge their reaction. The 2018 Ram 1500 makes a strong showing in light-duty trucks. From the line’s basic Tradesman to its exclusive Limited Tungsten edition, this tough truck is impressive at every level. At Woodbine Chrysler, we can help you choose from the many options available, including the off-road-ready Rebel. The 1500 offers a choice of three powerful engines. The standard is a 3.6-litre, 305 hp V-6. Strong and efficient, it delivers 269 lb-ft of torque. Next up is the 3.0-litre turbodiesel. Also a V-6, it produces 420 lb-ft of torque. Delivering 27 mpg on the highway in both rear-wheel and four-wheel drive, it’s a definite leader in its class. The 1500’s top-of-the-line engine is a 5.7-litre Hemi V-8, with 395 hp and 410 lb-ft of torque. The base engine is a six-speed automatic, with the other two featuring eight speeds. The 2018 Ram 1500 is available with a regular two-door cab, a quad cab with four doors and an even roomier crew cab that can comfortably seat six. Depending on your cabin selection, you can choose between a standard-length bed, short bed or long bed. A spray-in bed liner comes standard, along with 17-inch wheels and a full-size spare tire. Other features include a rear backlight and a Class IV trailer hitch. When properly equipped, this tough truck can tow up to 10,620 pounds. Inside the cabin, a Radio 3.0 user interface comes standard, along with a USB port and a 3.5-inch driver’s display. Eleven trim options give you plenty of upgrades with the 2018 Ram 1500. The cab’s standard vinyl upholstery can be upgraded to premium leather, with add-ons like heated seats and a heated, leather-wrapped steering wheel. Multiple enhancements are also available for wheels, chrome, lettering and lighting, and the infotainment package can be upgraded to include an 8.4-inch center display complete with navigation and a premium audio system. This impressive list of possibilities just gives you a glimpse of what the Ram 1500 has to offer. Visit Woodbine Chrysler to see the complete picture. The Durango, to distill it down to the essence, is a utility vehicle with considerable rugged capabilities and exceptionally nice road manners. With handsome, sauve styling, a refined cabin feel, and superb performance, it’s one of the best ways to go if you have a growing family…and a boat to tow on the weekends. Whether your idea of what a utility vehicle should be is soft and organic, or whether you’re a fan of boxy SUVs with brush guards and roof carriers, you’ll probably come to an agreement that the Durango is one of the better-looking three-row SUVs on the market. It combines some of the traditional, with a good dose of contemporary sculpting. The classic SUV stance is set up by the big crosshair grill, as well as a silhouette that doesn’t arch too much in any way—or taper. It’s just boxy enough without looking slab-sized. LED racetrack lighting, one of the latest Dodge family traits, forms a ribbon of light across the tail. Inside, almost none of the truck-like heritage has been carried over. The soft, flowing dash has thin metallic rings framing the major controls and a large touchscreen to rule the infotainment world. With leather upholstery, woven red inserts and red stitching, and white trim rings on the dials, the Durango feels less like an on-a-budget utility vehicle and more like a luxury SUV, done right. Last year marked the debut of a red Nappa leather interior for the R/T model; this year all models get new wheel finishes, four new exterior colors, and a few new appearance packages the combine gloss black and body-color details—aesthetically building a bit more on the Mopar motorsports and muscle-car cues elsewhere in the Dodge lineup. The Durango includes the same, excellent new eight-speed automatic transmission that’s used in the Jeep Grand Cherokee and other Chrysler products. It’s controlled via a stylish rotary shifter like the one used in the Ram 1500 and Chrysler 200, as well as paddle-shifters for all models. A pair of strong engines is available: the standard 3.6-liter Pentastar V-6 making 290 horsepower (or 295 hp) and 260 pound-feet, and a 5.7-liter HEMI V-8 making 360 hp and 390 lb-ft. Both are helped by the eight-speed auto to achieve acceptable fuel-economy numbers. HEMI feature so-called Fuel Saver Technology (cylinder deactivation), while V-6 models now include engine stop-start technology (ESS), and all models have a selectable Eco Mode that changes throttle sensitivity and transmission shift points to maximize fuel savings. All that said, the Durango is still especially thirsty in V-8 guise. Ratings slide to 14/23 mpg, or 17 mpg combined. And with all-wheel drive, it’s pegged at 14/22 mpg or 16 mpg combined. It may be worth it if you tow or need just an added amount of ruggedness, though. The Durango also offers a choice between rear-wheel drive and all-wheel drive, depending on the model. Two different AWD systems are used; V-8 models get a low-range transfer case, while V-6 models use a simpler a single-speed unit. Towing capability tops out at 7,400 pounds with the V-8. Seating for up to seven (or optional seating for six, with available second-row dual captain’s chairs) is one of the Durango’s top selling points. Its third-row seat is quite usable compared to other models this size, and it’s split 50/50, able to be folded flat into the floor. The standard second-row layout folds forward, too, to greatly expand cargo space. Dodge says there’s room for a six-foot couch and a coffee table, or to carry 10-foot 2x4s. The Durango scores well in crash tests and comes with a very impressive set of safety features, including seven standard airbags, full-length three-row side-curtain bags, and active front headrests. Blind-spot monitoring and rear cross path detection are available, as are adaptive cruise control with stop, and Uconnect Access, which includes some emergency and roadside-assistance services. The smooth instrument panel resembles the one in Dodge’s Charger sedan, and can house either a five-inch or 8.4-inch Uconnect touch screen in the center stack. As in other Dodges, the gauges are made up of a seven-inch reconfigurable TFT screen. The Durango is offered in SXT, Rallye, Limited, R/T, and Citadel models, with all but the SXT and Rallye getting the 8.4-inch Uconnect system that wraps together audio, climate controls, calling functions, and in some cases navigation. Turn instructions, audio info, or trip info can be displayed on the gauge cluster as well. In recent years, Dodge has been pushing the Durango up the luxury ladder, first with a Limited model—leather upholstery, heated seats, a heated steering wheel, and the 8.4-inch Uconnect system—and now with a Citadel model that piles on even more like the Beats by Dr. Dre audio system (10 speakers and a subwoofer). There’s an available HDMI and Blu-ray rear entertainment system, with screens integrated in the back of front headrests and a remote. And Uconnect Access Via Mobile also has voice-command capability (including to read text messages) and enables media apps for streaming audio like Pandora or Slacker. The Canadian new-vehicle market is expected to hit a new record when the numbers for 2015 are tallied. Minivans and cars are falling from favour, replaced by SUVs and CUVs. But one thing remains constant — Canadians love pickup trucks. During the past year I have tested seven pickups: Canyon, Colorado, F150, Ram, Sierra, Silverado and Tundra. They were powered by four-, six- or eight-cylinder engines and prices ranged from $30,000 to more than $70,000. One stood out. The Ram EcoDiesel. Like many Canadians, I understand and appreciate pickups. I own one (not a Ram). They have tremendous versatility, are able to carry or tow big and heavy items while providing spacious accommodation for five full-sized adults. The trend is toward more attention forward of the cargo box, with comfort, convenience and features that rival luxury cars — combined with more people space than any car. One thing pickups cannot provide is decent fuel economy. Until now. The average fuel consumption of those seven pickups tested last year was in the mid to low teens, (11.7-17.2 litres/100 km) on a combination of city and highway driving. I am talking real-world numbers, not those generated in a laboratory or on long level stretches of road with a steady throttle opening. Here in the Maritimes we see very little of that type of road as ours are more likely to have hills and curves — conditions that require constant throttle adjustment. Combine that with a heavy right foot and my numbers are always going to be well below that claimed by the manufacturers and proud owners who are always quick to remind me that they have done far better. But my boat was rocked this year by the Ram EcoDiesel. Over my usual 350-km test route, it used slightly more than half as much fuel as the others. During a subsequent four-province journey of more than 2,500 km, the big (5,700 lb) Ram EcoDiesel returned a stunning average of 9.6 litres/100 km at an average speed of 93 km/h. That number may not impress if you have no experience with pickups. As indicated above, under similar conditions, the competition ranged from 11.7 to 17.2 litres/100 km. The EcoDiesel numbers are even more impressive given that the vast majority of those miles were at 110 km/hr. At 100 km/h, the mileage was in the 8s! This from a loaded ($54,000), luxurious, big four-door pickup that tipped the scales at almost three tons on the road. I won’t go into the usual description of the amenities, comfort, etc., of a pickup at this price point. Suffice it to say the big rig was a wonderful companion during those 27 hours on the road. The lofty perch proved an excellent platform and provided great visibility whether in the freezing rain and light snow of an early morning in northern Quebec or driving rain in PEI that same evening. The excellent ride, comfy seats, excellent climate control system, easily deciphered infotainment system and relatively quiet cabin helped pass the time. Those same features are readily available in other pickups. The full-sized ones all offer diesel engines — but these big and extremely powerful units are workhorses, designed to allow the truck to carry or tow massive amounts. The EcoDiesel is what I would call a light-duty diesel, a 3.0-litre V6 from VM Motori, an Italian company with a relationship to Chrysler, sorry FCA, dating back to 1992. Fiat bought the company in 2013. The EcoDiesel offers more torque than the vaunted Hemi V8 and paired with the ZF eight-speed automatic, better fuel economy. Much better. BUT — and here is the flip side of the coin — the EcoDiesel is expensive and you have to rely on high mileage and reasonable diesel fuel prices to recoup that extra cost. Driven with even a slightly lighter right foot, the Ram EcoDiesel will easily match the Natural Resources Canada rating of 8.8 litres/100 km. No other full-size pickup can even approach that number. This engine, paired with the mandatory eight-speed ZF automatic transmission, adds $5,700 to the cost of the Ram truck. That would buy an awful lot of gasoline. If you plan on keeping the truck for years and/or accumulating high mileage, the EcoDiesel will make up that difference — while providing effortless real-world power and the ability to go more than 900 km on a tank of fuel. Sales of minivans are dwindling in North America, but they’re still a big deal at Pothier Motors Ltd. – and an even bigger deal at the auto maker that supplies the Falmouth, N.S., dealership. Minivans are a key franchise for FCA Canada Inc. (Chrysler), which ships Dodge Grand Caravan and Chrysler Town & Country models from its Windsor, Ont., assembly plant to Pothier. So dealership president John Pothier understands the importance of the $2-billion (U.S.) investment FCA Canada’s parent company is making to redesign the people haulers. The redesigned model will be introduced at the North American International Auto Show in Detroit on Jan. 11. “It’s going to be huge for them,” said Mr. Pothier, who is president of the Chrysler Dodge Jeep dealership. His store sells about 100 to 125 new Dodge Grand Caravans and Chrysler Town & Country models annually, representing about 20 per cent of Pothier’s annual new vehicle sales. That’s the same share of new vehicle sales the minivans represent for FCA Canada. The Town & Country and Grand Caravan outsell the entire lineup of Chrysler, Dodge and Fiat passenger cars by almost two to one. The Grand Caravan on its own is the second-best-selling vehicle in the auto maker’s lineup after the Ram pickup, even though the company’s minivan sales have fallen 10 per cent this year. Spending $2-billion to upgrade a vehicle whose sales have fallen in a segment that has also slumped might normally be considered folly, but minivans have been one of the flagship vehicles for Chrysler since Lee Iacocca, the legendary chief executive officer of Chrysler Corp. at the time, drove the first one off the line of the Windsor Assembly Plant in 1984. A decade later, the auto maker added a third shift to the Windsor plant and the factory has been rolling at full tilt since then – with the exception of a temporary shutdown when Chrysler LLC was in Chapter 11 bankruptcy protection in 2009. Chrysler has held the lead in the segment by continually offering features that kept it ahead of the competition, notably the first driver’s side sliding door on a minivan in 1996. Industry sources said one of the innovations on the 2017 model will be foot-activated sliding doors and rear liftgate. The auto maker has said there will also be a hybrid version of the vehicle. The Chrysler twins combined lead the minivan segment in both the U.S. and Canadian markets, but the numbers are working against them. Minivans grabbed 7.4 per cent of the U.S. market in 2000 and nearly double that at 14.5 per cent in Canada, where the vehicles have always been more popular. In 2015, minivan market share slumped to 2.8 per cent in the United States and 4.5 per cent in Canada amid soaring sales of crossovers, which have some of the utility of minivans, but none of the stigma. That steady decline from 2000, when auto makers sold more than 1.5 million minivans, led several companies to abandon the market, including Chrysler’s Detroit-based rivals Ford Motor Co. and General Motors Co. and South Korea-based Hyundai Motor Co., whose Entourage model was discontinued after just four years in the market. Nonetheless, industry analyst Joe Phillippi, who heads AutoTrends Consulting Inc., said he believes the segment has stabilized and should grow modestly as more millennials start having children. “There’s a demographic cohort that really do view minivans as a great value, as a people mover for the family,” Mr. Phillippi said. He points to his own daughter, a mother of three children, whose family owns a Honda Odyssey minivan and a Ford Explorer crossover. The original plan for the redesign of the Chrysler minivans was to replace both of them with a single model, the Town & Country. But the Canadian and U.S. markets differ. Sales of the models are about even in the U.S. market, but Canadians bought 46,927 Grand Caravans last year, compared with 9,001 Town & Country models. Mr. Pothier said he keeps just one or two Town & Country minivans in stock in Falmouth, compared with about 30 Grand Caravans. So Canadian dealers have urged the auto maker to retain the Dodge Caravan name and the less expensive version of the vehicle in Canada. “I do not sell a lot of Town & Country [models],” said one Chrysler dealer in Western Canada. “The customer profile we sell Caravans to are not going from the yacht club to the private golf club.